How is everyone? Hope, you had an amazing week. It's been very busy last couple of weeks so I had no choice but post only once a week. I hope, I will be more active from this week. Today, I want to show you guys my first ever VoxBox from Influenster. 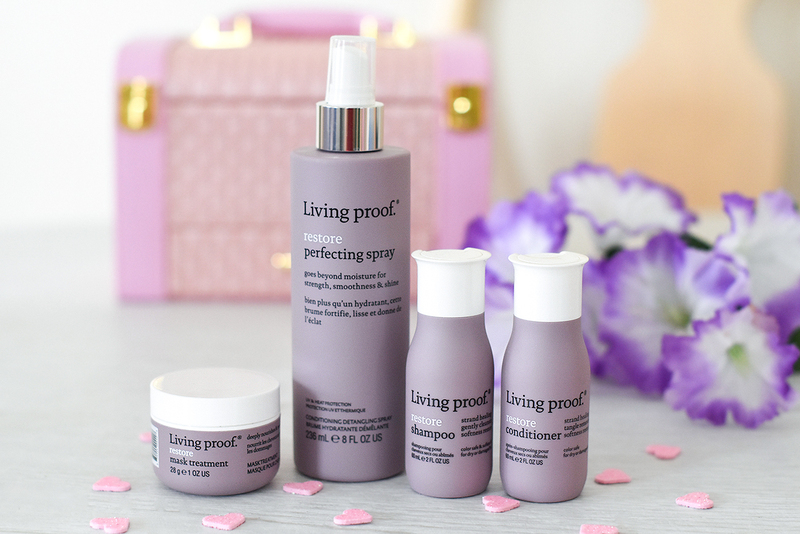 I got these Living Proof Restore hair care * products: travel size shampoo and conditioner, hair mask, and full size hair perfecting spray. Since I have dry, color treated hair, I'm always looking for some good hair care products that can keep my hair nourished, smooth and shiny, and this was a great opportunity for me to try new products. This Living Proof Restore System claims that it "instantly restores damaged hair cuticles; restores moisture levels for healthier hair; protects from future damage and strengthens hair to become 20x more resistant to breakage." So these sulfate-free and silicone-free hair products are ideal for dry, damaged, color and chemically treated hair. Living Proof Restore shampoo and conditioner, hair mask, and hair perfecting spray. Let me start from Shampoo: it didn't made my hair dry (like many other shampoos do, so that was already a good thing for me) but I didn't notice any special softness either. What I liked about this shampoo is that it made my hair feel clean without that silicone feeling. It also had very pleasant smell. 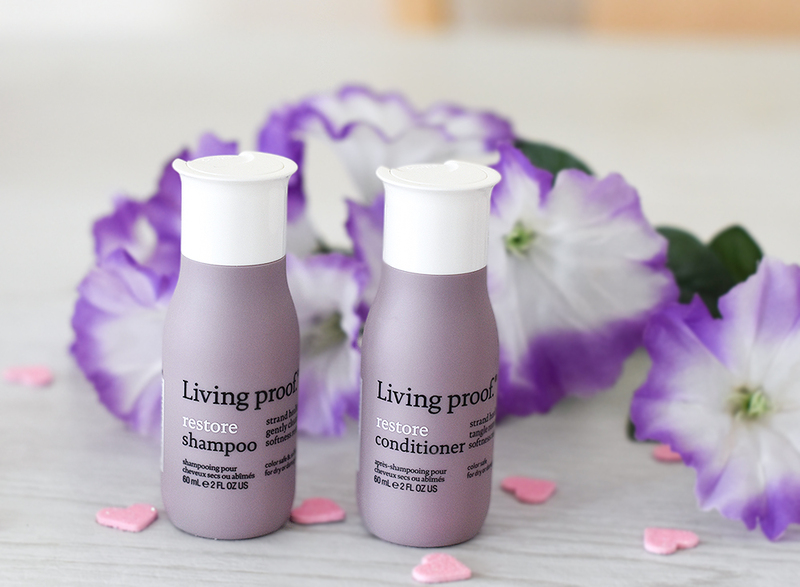 Once I applied this Living Proof Restore conditioner, my dry hair instantly became smooth and silky. Even though I got these Shampoo/Conditioner in travel size, I still managed to use them twice and I felt so much difference in my hair texture when I applied them second time. I believe, they would make damaged ends of my hair healthier, if I used them more often. I loved Living Proof Restore Mask Treatment too. I applied it after shampoo and left it on my hair for few minutes before rinse it off and it made my color treated hair super smooth. Since it was also in travel size, I could only use it once, so keep in mind that my experience about these Shampoo/Conditioner/Mask is based on short time period. And finally: Restore Perfecting Spray. This is probably my favorite product among these, and I'm so happy it came in full size: this hair spray "provides strength, smoothness, natural shine, UV and heat protection up to 400F. " I've used it a few times already, I apply it after shower and then blow dry my hair. I love that it makes my wet hair so much easier to comb through, and, It feels and smells amazing. Honestly, my hair has never felt so healthy, smooth and silky since it's been color treated. If you want to see how my hair looks after using these products, check out my Instagram. Have you tried any of these products? let me know in the comments below and have a wonderful day. Hi nice review i would love if you mention the link of that product. non ho mai provato i prodotti .. I am a big fan of Living Proof. Jennifer Aniston is there spokesperson and her hair is always on point. Thanks for sharing! No, I never tried this brand before, but I liked that the Living Proof restore shampoo didn't leave you hair dry, because I know some that dries the hair out. I would like to try this shampoo, it seems to be really great! Hope you have a wonderful week! This brand is in my wish list to try, the price is pretty high though but good to know you have great experience with these products! I really want to try that spray! Great review! Never used any of those before! A must try! I don't have dry hair but I started colouring my hair again recently so I'm looking for some additional care. These restore hair products seem great. I have dry, dehydrated hair so will definitely check this range out! I haven't heard of living proof before! I haven't tried anything from this line, but it sounds great! We love living proof! They make the best products and they smell so good!! I hear so many amazing things about Living Proof! I've never tried Living Proof yet, but heard so many amazing things about it! Will give it a try! Thanks for share!!!! I'll try it! This is the first time hearing of these products, they sound lovely especially Restore Perfecting Spray. Thanks for sharing. Aww! Need to try! Thanks for sharing! The perfecting spray sounds like a winner! I've only tried their dry shampoo which is really good! I've always been curious about their hair care products. Glad they worked for you. They sound great.